I think Alice In Wonderland tattoos are awesome. First off it was one of my favorite cartoons growing up as a kid. I like the new one as well with Johnny Depp it is just a little freaky. This idea is great tattoo because there are so many different scenes you can get on you. If you get the right artist this can come out amazing, because Alice in wonderland is full of bright and detailed images and really unique quotes. 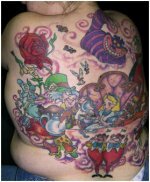 When choosing a topic for your Alice in Wonderland tattoo you can go with a lot of different options of tattoo styles. Some of those are quote tattoos, grey wash images, bright trippy color images or even for the white rabbit you can go with a white ink style of tattoo. As I said with all artists you do not just want to go into the first shop you see and have them work on you. Make sure you research the person ask others about them, look at their work if they have books of it, look around the shop making sure it is a nice, clean and friendly atmosphere. 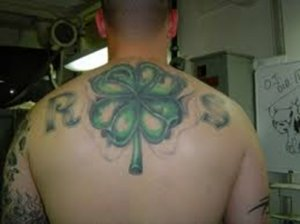 To help the artist better do your tattoos if you have a specific drawing or picture of what you want you should definitely bring it in. If the tattoo is going to be a portrait of one of the characters make sure your artist can do that, because portraits are very hard and time consuming. 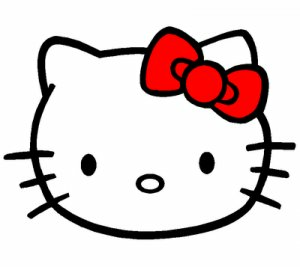 Also consider this first when getting an Alice in Wonderland tattoo it will be on your body for the rest of your life. So make sure that is going to be what you want and can hide it in case of a job or career that you are trying to get. 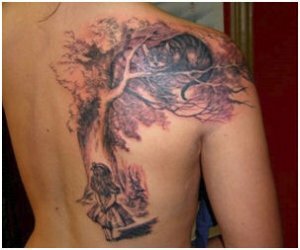 I am going to post some different style Alice in wonderland tattoos that may help you in deciding what you want to get. 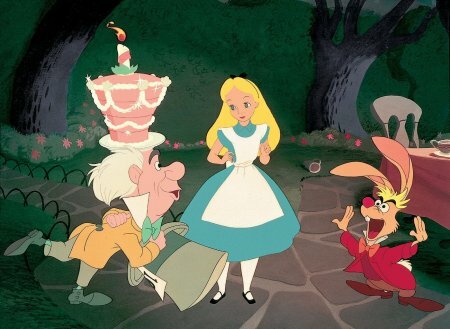 There are many remakes and take offs of the Alice in Wonderland story. No doubt every person has their favorite movie or show. When you decide to get an Alice tattoo you should make sure to specify which character you want and which remake it is from. This is a tattoo of artwork from the original Alice in Wonderland book. There are thousands of quotes from the various Alice movies and even more from the original book. 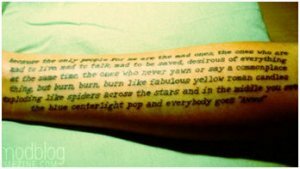 Quote tattoos are a great way to show your love for a book. My favorite quote from the book is when Alice says "I can't explain myself, I'm afraid, Sir, because I'm not myself you see." There is no one saying that you can only get one Alice in Wonderland character tattoo. You can get an entire scene on your body or just a montage of characters. Since it is your body and tattoo you can even make up a scene. The Alice characters can look anyway you please and do whatever you want them to do. 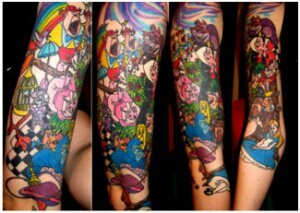 This tattoo has several scenes from the Disney cartoon of Alice in Wonderland. There is the Mad Hatter, Twiddle Dee and Twiddle Dum, Alice and the Cheshire Cat. If you love tattoos and can't decide which character to get than you should consider a large back tattoo which will get all your favorite Alice friends. This is a black and white Alice in Wonderland tattoo. This image is from the Original Caroll Lewis book. It shows Alice under a tree while the Cheshire cat is looking at her from above. I personally love the artwork from the original store. 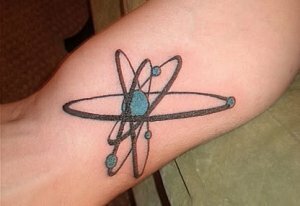 If you loved reading the book when you where a child or even know as an adult than this is a great tattoo idea. The last Alice in Wonderland movie starred Johnny Depp as the Mad Hatter. This was a great role for him since he always plays strange parts in movies. 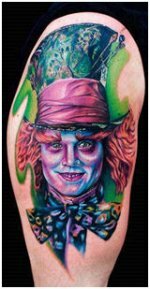 The Hatter is a great tattoo idea because it is colorful and fun. You can get Johnny's Mad Hatter character or my personal favorite the Hatter from Disney's Cartoon. Just remember to make sure he is wearing a big colorful hat. A lot of people get Alice tattoos that have her holding a bloody knife or with a crazy look on her face. This is popular because of the Alice computer games. If you like horror and gore than you might want to consider a demented Alice or Cheshire cat tattto. I think it would be even better if you wrote the quote "Off with her head" underneath the tattoo. This is a great Alice tattoo. 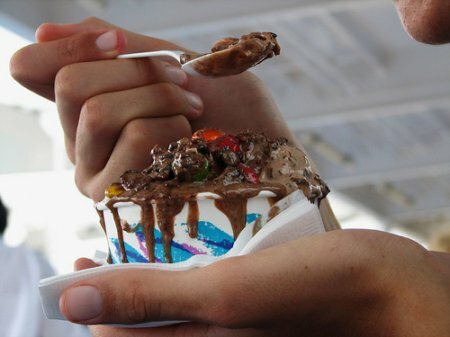 It is the famous drink and food from the beginning of the story. When Alice eats and drinks she grows and than shrinks. This is a fun and unique tattoo is you aren't really into getting tattoos of the characters. Everyone who sees them will know where they came from and what they mean. 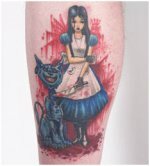 Share a link to a page on Alice In Wonderland Tattoos and we will consider it for placement on this page.